As the resident golf pro of 346 Madison Avenue, which features an in-house golf simulator for our customers, Federico Frangiamore explains inclement weather doesn’t mean you can’t refine your game in the comfort of your home. Whether it’s mastering the mental aspects of golf or practicing your putting, here are some tips and drills that will take your game to the next level. According to Frangiamore, a golfer has four swings in his or her repertoire, with each being useful depending on the circumstances. The first is used at the driving range and is meant to refine your timing and form through repetition. The second comes out during lessons, when a player is actively working to achieve consistency in his or her swing by incorporating an instructor’s tips. The third is reserved for the course, when playing with friends in a low-stakes match (pressure is low, which allows for a smooth and effortless swing). Last is a swing designated entirely for competition, when the game demands one’s best. Ideally, the swing one practices for hours is employed at that moment when it’s most important. Regrettably, a well-practiced swing doesn’t always present itself when needed most. Why? Because it’s easy to overthink things in the heat of a high-pressure situation like a tournament. If you aren’t used to playing when stakes are high, it’s entirely possible to dwell on each mistake—which can ruin your mindset and lead to additional errors. The trick is to focus on what you can control in the moment. What’s past is past, so the idea is to focus on the current hole—the current shot—and take the game one step at a time. There are plenty of moments to learn from mistakes afterward, so keep focusing on what you can control. Antsy to get back on the green? 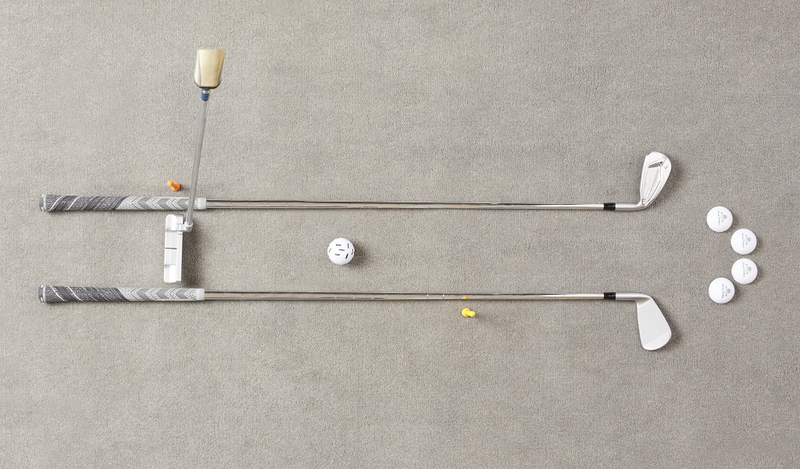 Brush up your fundamentals without the need for a driving range with this putting drill you can do at home. 1. Find a space on the floor anywhere from three to eight feet. 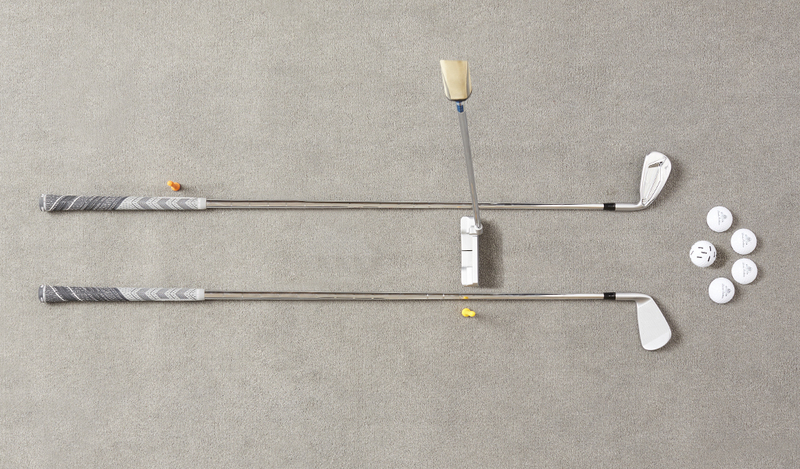 Line up two clubs of similar length with the club faces pointed at a target, keeping the clubs at a length that allows for the putter’s face to neatly fit between them. 2. Find a space on the floor anywhere from three to eight feet. 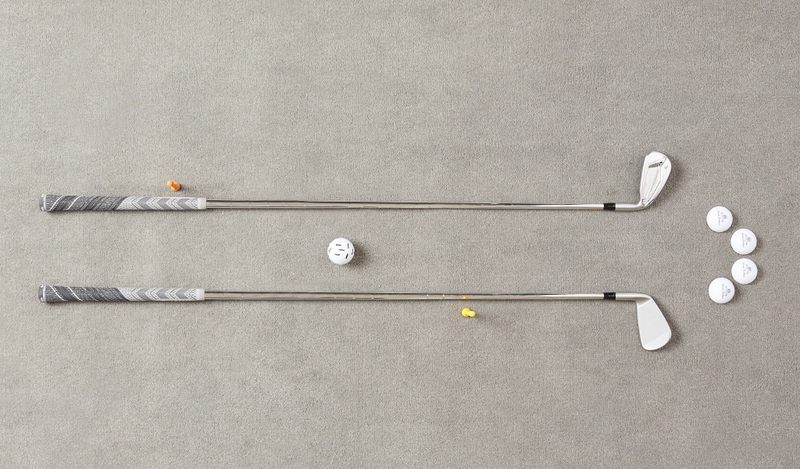 Line up two clubs of similar length with the club faces pointed at a target, keeping the clubs at a length that allows for the putter’s face to neatly fit between them. 3. Set your feet and your stance against the third club and grip your putter, holding it a little shorter than you usually would. As you swing, make sure your putter doesn’t break the boundaries set by the clubs on the ground and the two tees. Practicing this way will help improve your rhythm and technique, forcing more use of your shoulders and arms while keeping your wrists straight. Your upper body should feel like a pendulum when you swing: a smooth, symmetrical back-and-forth that will become repeatable with practice. Many golfers don’t put enough consideration into selecting the grip on their clubs, choosing instead to play with a standard grip that is too small for their hands (which wears out quicker). Use this downtime to size up, in both length and thickness, and take a few shots at the driving range with your new grip. Proper grip feel is very subjective; you’ll know that sweet spot when you feel it. To make an appointment for our golf simulator and with Federico, email blog@brooksbrothers.com or call our Madison Avenue store at 212.682.8800. Click here to read more about Federico.